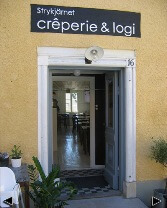 Visby's Strykjärnet is a small and simple creperie in the center of the old Swedish Hansa city. They serve very tasty crepes and galettes for reasonable money. The menu sports a wide selection of galettes and crepes. Ranging from ruccola and salmon to beef, the fillings number in the 30's for the galettes. Crepes come in all the expected flavors, such as sugar and lemon or strawberry jam, but also more unusual tastes such as pine nuts and cloudberry jam. The food selection is rounded out by excellent coffee, teas and desserts. For two galettes, coffee and tea (table water is included) we spend SEK 212. That bought us a great tasting lunch and a convenient spot to people watch. Service was competent, casual and swift. Our visit unfortunately took place during a pretty chilly June day and the parasols blocked out most of the sun on the patio. Blankets are provided but gas heaters would have been handy. We think it'd be warmer on the back patio when it's open. Overall, Strykjärnet has a laid back and friendly atmosphere. On the top floor, the creperie also has a room to let for weary travellers. We didn't check this out, but it's a great location. Last updated by jack on 27 June, 2007 in Food And Drink.